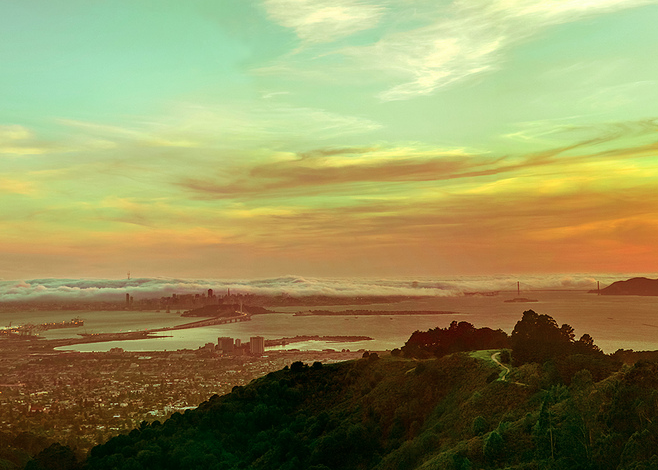 A stunning view from the East Bay hills. Luxury homebuyers in California love hilltop views. An oceanfront home? Not so much. Forty-one percent of buyers who purchased luxury homes in the state last year opted for a property with a hilltop view, according to a survey by the California Association of Realtors, which defines a luxury home as one costing $1 million or more. Just 10 percent bought an oceanfront home. In fact, hilltop homes were so popular that they bested oceanfront homes and ocean-view homes combined (38 percent). Sixteen percent of buyers in 2013 picked up luxury homes located near golf courses, followed by those in mountain areas (12 percent), resort areas (9 percent), lakefront (4 percent), and ski resorts (1 percent). Most homes sold for $1 million to $2 million (76 percent), with 13 percent priced from $2 million to $3 million, 6 percent from $3 million to $5 million, and 3 percent from $5 million to $10 million. Luxury buyers had a median income of $350,000, according to the survey, and a median age of 53. Seventy-one percent were Caucasian, 74 percent had a college degree, and 48 percent were single. One-quarter of luxury buyers cited the desire for a larger home as the main reason for their purchase, while 20 percent said they wanted to upgrade their location. The survey found that 35 percent of luxury buyers paid cash for their property, compared with 27 percent of traditional buyers and 11 percent of first-time buyers. Because luxury buyers are likely to have larger incomes, they were also able to make average down payments of 30 percent — 5 percent higher than traditional buyers. Nearly 56 percent of luxury buyers financed their down payments via personal savings, while about 28 percent used proceeds from an investment. In the Bay Area, luxury-home sales have jumped dramatically over the past year — up an average 27 percent from the first quarter of 2013 to the first quarter of 2014 in Pacific Union’s nine Northern California regions. By the way, luxury buyers’ love of views was confirmed in another recent survey mentioned on Pacific Union’s blog. That Realtor.com survey found that 44 percent of buyers consider the home’s views of mountains, oceans, or cityscapes to be the second most important feature when considering a luxury purchase. The most important feature, at 54 percent, was a chef’s kitchen. Next PostNext Remodeling in Advance of a Sale? Pay Extra Attention to the Kitchen.